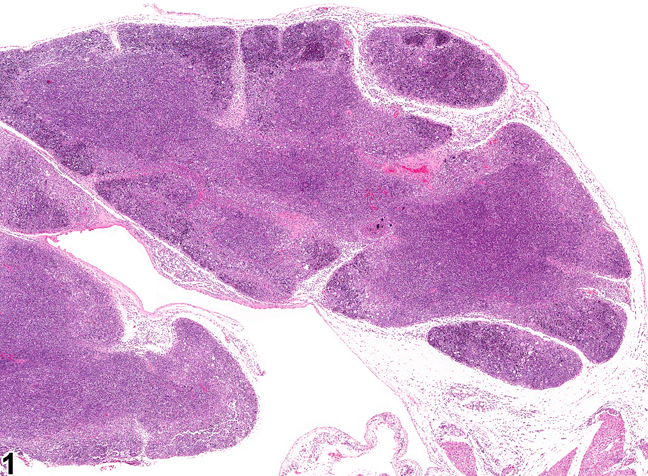 Thymus - Necrosis, Lymphocyte in a male Harlan Sprague-Dawley rat from a subchronic study. Treatment with dexamethasone resulted in severe lymphocyte apoptosis with focal areas of necrosis. Thymus - Necrosis, Lymphocyte in a male Harlan Sprague-Dawley rat from a subchronic study (higher magnification of Figure 1). 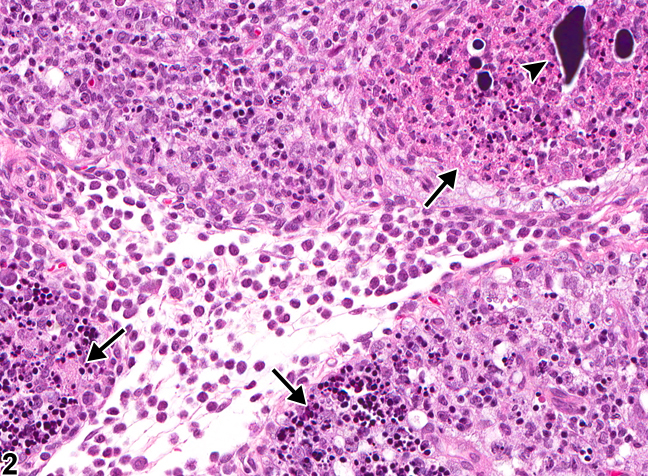 Lymphocyte necrosis (arrows) is accompanied by eosinophilic cytoplasmic debris, basophilic nuclear debris, mineral (arrowhead), and inflammation. Necrosis of thymic lymphocytes can occur in rats and/or mice as a direct effect of toxicants such as corticosteroids, estrogen, and cyclophosphamide, and usually in conjunction with severe lymphocyte apoptosis. The cortical and/or medullary lymphocytes may be involved ( Figure 1 ). Necrosis may also involve all cell components of the thymus. 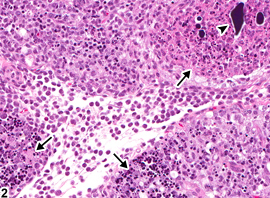 Necrosis is characterized by cell swelling, condensation and dissolution of the nucleus, and cell lysis with accumulation of abundant eosinophilic cytoplasmic and basophilic nuclear debris ( Figure 2 , arrows). Necrosis is usually accompanied by inflammation and may also be accompanied by hemorrhage and/or mineralization ( Figure 2 , arrowhead). Significant lymphocyte necrosis may lead to atrophy of the thymus, with or without thymic regeneration. Necrosis of lymphocytes must be differentiated from lymphocyte apoptosis, although they can occur together if apoptosis is severe and apoptotic factors such as caspases and ATP are depleted. Apoptosis typically involves shrinkage of individual lymphocytes, condensation of nuclear chromatin, and fragmentation of apoptotic cells into apoptotic bodies. Apoptotic bodies are phagocytized by macrophages (tingible-body macrophages). Apoptosis is not typically associated with inflammation, hemorrhage, or mineralization. Whenever there is necrosis of thymic lymphocytes, but other components of the thymus are spared, "Thymus - Necrosis, Lymphocyte" should be diagnosed and assigned a severity grade. A diagnosis of "Thymus - Necrosis" should be made when all cellular components of the thymus are necrotic. Necrosis-associated inflammation, hemorrhage, or mineralization should not be diagnosed separately unless warranted by severity, but should be included in the pathology narrative. Lymphocyte necrosis must be differentiated from lymphocyte apoptosis. If lymphocyte necrosis and apoptosis occur concurrently, diagnose and grade both lesions. Elmore SA. 2006. Enhanced histopathology of the thymus. Toxicol Pathol 34:656-665.